Now we come to our third boat in this series of European family cruising boats. 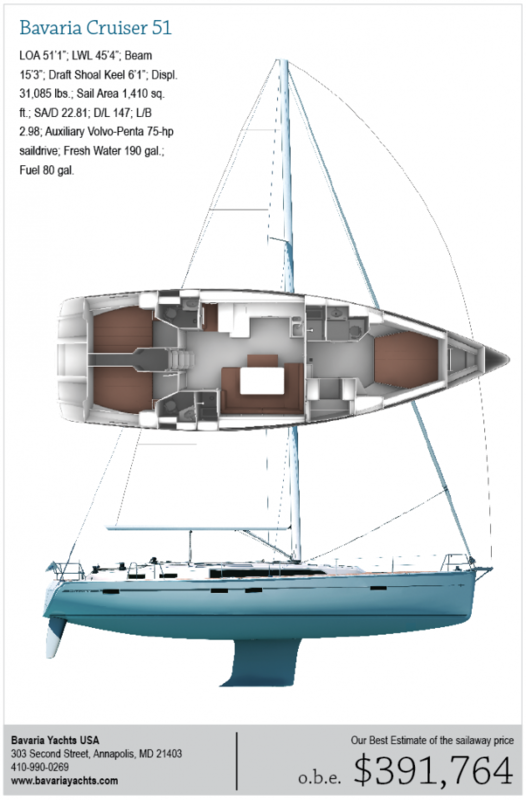 We move up 10 feet to the new Bavaria Cruiser 51, designed by the Farr design office in conjunction with Design Unlimited. This boat differs from the other two this month in that it does not have a chine aft. In fact, the turn to the bilge at the transom is on the soft side in marked contrast to the hard corner of a chine. The Bt/Bm ratio is 86%, indicating that this boat has more aft taper than the other two boats. The D/L is 147, and the L/B is 2.98. All three boats have pushed the beam to an L/B below 3.00 so they are all very beamy boats. The transom of this Farr design shows some shape and a slight amount of rake rather than the near vertical transom profile of the other two boats. I prefer the stern treatment of the Farr boat. You can choose from two keels of 6-feet 1-inch and 7-feet 5-inch draft. There are twin rudders. The Bavaria 51 has three interior layouts. You can choose from three cabins, four cabins or five cabins. That's correct. There is one layout where the V-berth area is split down the centerline to squeeze in two cabins to get a total of five separate sleeping compartments. All the layouts feature three heads. If you want four sleeping cabins then you get a tight room forward of the main bulkhead to port with stacked single berths. If you go with the three-cabin layout there is what appears to be a walk-in hanging locker in the forward stateroom. The two quarter cabins aft both have their own heads. This boat is a real study in what you can do with layouts in 51 feet. There is a nav station aft to port in the main cabin, and the galley is forward of this and stretches down the port side. The dinette has a centerline bench seat, and I suppose if you were all really good friends you could crowd eight people around this table. It would work if you were having wieners for dinner and kept them orthogonally lined up, but I can't see eight full-sized dining plates on this table. But given that many of these boats will be chartered where it is warm, I suspect that a lot of dining will be going on in the cockpit. This cockpit is huge. Again there are twin wheels. Twin wheels have the benefit of opening up the cockpit so you can walk through to the fold down boarding platform, a feature shared by all three boats this month. But with its added LOA the 51 does provide seating room aft of the wheels. There is a large drop-leaf table in the cockpit and at the aft end of the table is the console for the instruments. The deck has a teak overlay, and all the deck hatches are flush like those on the Dufour. This provides a very clean and safe deck. The cabintrunk is nicely sculpted and very similar in style to the other two. Additional light below is provided by four long, rectangular deadlights in the hull sides. The headstay almost goes to the masthead. They leave enough room at the masthead to keep the chute from tangling with the headstay. Spreaders are swept, but the chainplates are just inboard of the rail and not on the hull. The SA/D is 22.81. It's been fun to look at three different boats, all a slightly different from each other, but designed for similar target markets.